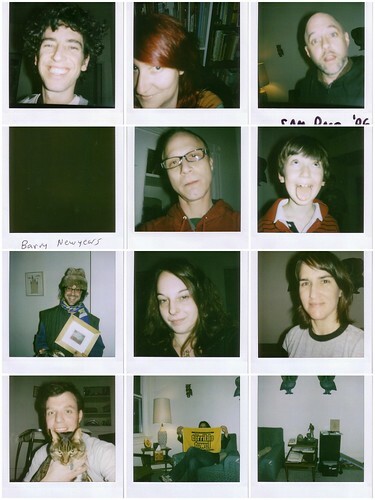 Since about 1995, it's been something of a tradition for me to take Polaroid pictures of people on New Year's Eve. There are dozens from some years and only one or two from others. This past year, we were at home with friends. I left the camera on the dining room table and asked that everyone present take a self-portrait at some point through the course of the day. You can see the results above and I have to say, I like this project. I like taking pictures of people, but I also love self-portraits. It's always interesting to see how people present themselves. I think that I'll do this again. In this particular series, I think my favorite is the one of Julie (#11), because she's the only one who chose to use the self-timer!! Ivan (#6) and Eric (#7) are not actually self-portraits, but I've included them because they were taken on that day. We never did figure out why the first picture Barry took (#4) came out completely black or who took the Mystery Photo (#12).